The Seagull nebula and IC 2177 is a hydrogen emission complex along the border between the constellations Monoceros and Canis Major. IC 2177 is the bright nebula with the dark lane right of center. 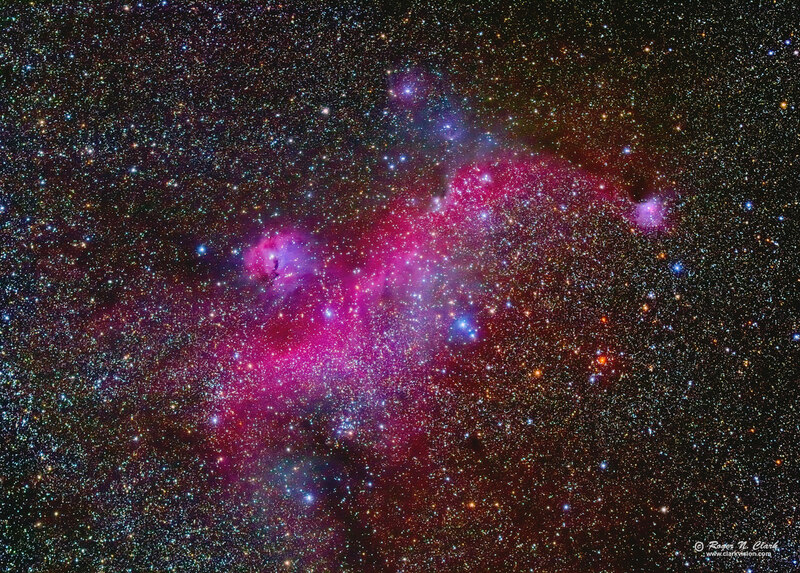 The "wings" portion of the reg-pink-magenta nebula has been coined the Seagull by amateur astronomers, and IC 2177 is the head of the Seagull. Blue reflection nebulae are also visible in the scene. I could see parts of this nebula in the camera viewfinder, which enabled me to center it. The nebula shows some interesting properties. Hydrogen emission in visible light is composed of red hydrogen alpha emission and bluish hydrogen beta and gamma, combining to pink/magenta. On the upper parts of the wings, the hydrogen emission appears redder because interstellar dust is absorbing the blue hydrogen beta and gamma. Further from the wings we see dark regions--areas of denser interstellar dust. Below center, the nebula is a a little orange, and above the wing on the right the orange is more prominent--that is the signature of interstellar dust transmitting some starlight. The region is peppered with stars of various temperatures, cool red and orange stars, to hot bluish-white stars. Most stars in the scene are yellowish-white, like our sun. Celestial north is to the left. This is a natural color image. The high dynamic range of astrophotos must be stretched to bring out the range of details the camera recorded. But the typical image stretch process loses color for brighter subjects (e.g. stars and the brighter parts of deep sky objects become whiter as they are made brighter). This image uses a new Rawtherapee raw conversion method, and a new algorithm, rnc-color-stretch that does not lose color during the stretch. How do we know the colors are reasonable? The star colors can be checked against stellar photometry. Red stars have B-V > 2, orange stars have B-V of 1 to about 2. The blue-white stars have B-V in the range of 0 to -0.5. The colors closely follow the color sequence in Table 1 at Color of Stars. Solar-type stars have a B-V of 0.63 and appear close to white (daylight white balance). Technical. Canon 7D Mark II 20-megapixel digital camera and 300 mm f/2.8 L IS II at f/2.8, ISO 3200. A total of 124 thirty-second exposures at ISO 3200 were added (62 minutes total exposure). I would normally use ISO 1600 and 60-second exposures, but wind was gusting to about 30 miles per hour, so I shortened the exposure in case of camera shake. I was able to use all of the exposures, despite the wind. Full resolution image is at 2.8 arc-seconds per pixel. No dark frame subtraction, no flat fields. Tracking with a Fornax Lightrack II and no guiding. My tracking setup is described here. The image was made from a "dark green zone" on the light pollution map, on the Big Island of Hawaii at an elevation of 1,000 feet. Post processing: Converted in rawtherapee with color preserving methodology, aligned first with ImagesPlus then refined with deep sky stacker, then stretched with rnc-color-stretch. Also see Astrophotography Image Processing Basic Work Flow. I applied Richardson-Lucy deconvolution to improve resolution on the brightest parts of the nebulae on the stacked and stretched result, though that detail is smaller than can be seen in this web image. CEFA = 43,700 minutes-cm2-arc-seconds2 (2.8 arc-seconds / pixel).